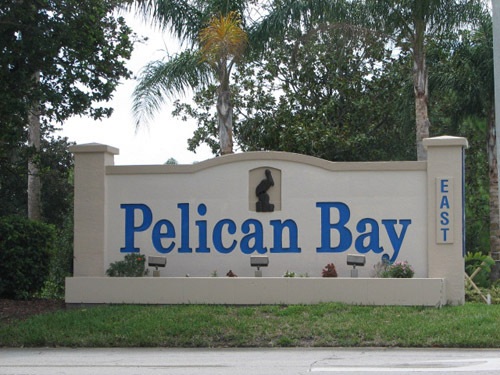 Welcome to the Pelican Bay Web site specifically for Pelican Bay residents and interested purchasers. Twenty-four hour manned guard houses at both entrances, with twenty-four hour roving patrol. Control of resident’s entry through barcode system. Control of visitor entry through registration with guards at each entrance. Maintenance of 110 acres of waterways. Two golf courses- Privately owned/Open to public-Additional fees apply. Pickle ball court- Privately owned/Open to public-Additional fees apply. Tennis court- Privately owned/Open to public-Additional fees apply. Do you want to get rid of some things in the garage, list your items in the free Classifieds in the Topics section. Please take a tour and see the wonderful information and services that are now at your fingertips. Come back often . Brought to you by the Pelican Bay Homeowners Association. Contact Us if you have any questions. The 2018-2019 cable year is the last year of the contract between Spectrum and the HOA for discounted bulk service. The contract will end on August 31, 2019. Residents that have Spectrum through the HOA will need to make arrangements prior to August 31, 2019 to ensure that they do not experience service interruptions to their cable. You are not required to use Spectrum for your cable service, you may use Spectrum or a provider of your choice. Please note that Florida is home to many types of wildlife including snakes, alligators, bears, bobcats etc. Please click below for information on Florida’s snakes from the Florida Fish and Wildlife website.